The 1940 census began 72 years ago when census enumerators covered the streets of America, documenting every person. This was a very large United States government project; for example, it took 29 census takers just to cover the population of the city of Marietta, Georgia. Today the 1940 U.S. census was released online completely free to the public. This census release gives genealogists and family historians a fantastic new ancestry research tool. With information on 132 million U.S. citizens, these historical census records are flush with clues we can use to research our genealogy and learn about the lives of our recent American ancestors. As you dig into the 1940 U.S. census records while doing your own family history research, take some time to read about the great effort it took the U.S. federal government to create this valuable genealogical resource. 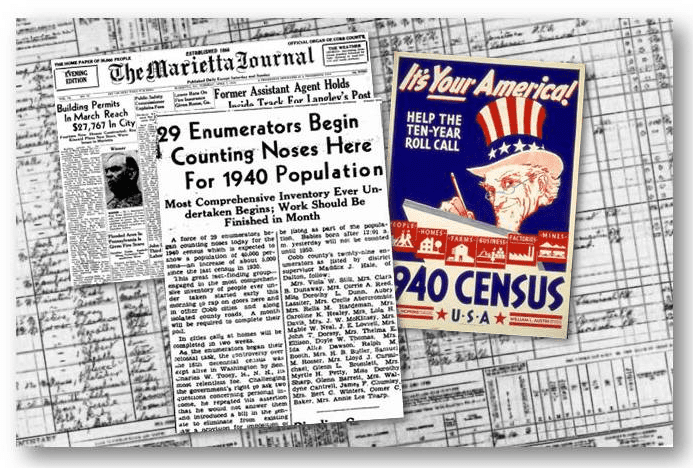 The historical newspaper article shown in the graphic above, detailing the work the 29 U.S. census takers did in Marietta, was published by the Marietta Journal (Marietta, Georgia), 2 April 1940, page 1. Find this old newspaper article and other 1940 census articles in the Marietta Journal, or search our entire historical newspaper archives to discover similar articles about the 1940 census from newspapers all across the United States. Of course, the 1940 census gives us a snapshot of our ancestors at just one point in time: April 1, 1940. Use GenealogyBank to read about every day of their lives—with newspaper articles from our collection of just under 6,000 newspapers, from all 50 states, going back over 300 years—as well as historical books and government records and documents available at our website.